Drilling permits issued in the Ohio Utica Point Pleasant shale play continue on an upward trend according to recent data published by the Ohio Department of Natural Resources (DNR). August 2012 saw the largest ever number of permits issued with 46. 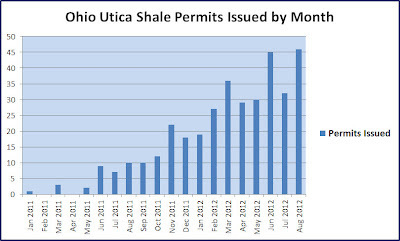 The chart below, compiled from data provided by the Ohio DNR shows that August just edged out July (45 permits issued). Also, compared to August 2011, which saw just 10 permits issued, August 2012 numbers are impressive. As more and more operators look to delineate their acreage, and other operators share impressive production numbers, activity should continue to increase.